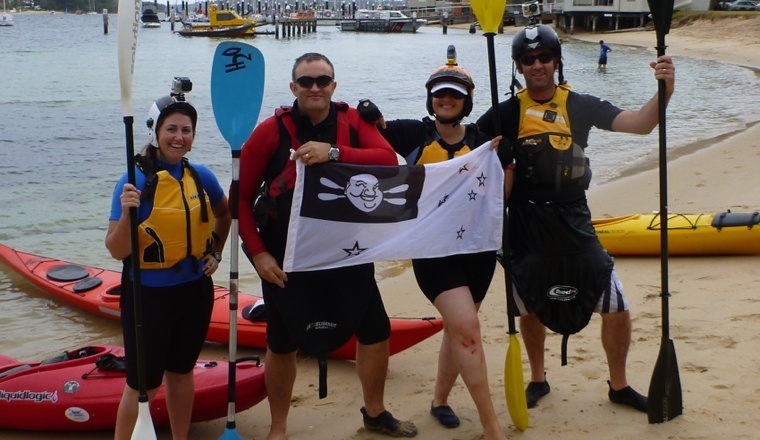 Team Fat Paddler is a growing organisation of paddlers under one banner who take on challenges – charity challenges, personal challenges, and even some silly challenges. Officers of Team Fat Paddler earn their commission through continued participation in such events – the more events they are a part of, the higher their rank. Sean is the original Fat Paddler and loves surfski surfing, paddling near cliffs and time with his girls. He spends a fair bit of time on, in and on occasion, under the water! The BigYahu is a big man with a big fast boat. He loves nothing more than paddling alongside his team members – unless it’s a race that is. In which case he’ll be 30mins ahead of everyone else. Has followed the Fat Paddler into danger many times before – first on the rugby field, and now on the water. Is the Propaganda Officer for the team and loves his ocean ski. Grumm is one of a handful of Brit paddlers in the team and loves wine, rudders and boats that can turn. As a high ranking officer, he is expected to lead by example. Especially at the pub. As the first Aussie female active paddling member of TFP, Meg has been superb at fitting into the team. She races, she falls out, she drops her kayak and breaks it… and all whilst having a good laugh! Gelo is the poster boy for the team. Loves all things Greek but has a habit of destroying himself during events. Rumour has it he now has a bionic shoulder after the Warrior Dash “incident”. Ben is a truly big man paddling his way to success. A long term Groupie of TFP, Ben’s persistence with his campaign to join Team Fat Paddler culminated in a formal invitation being issued at the 2012 Kayak for Kids. We expect big things from Ben… literally! When not smashing herself in a Crossfit box somewhere, she can often be found paddling her surfski and complaining about how sore she is from the gym the day before. Probably the toughest member of TFP! Burnsie is an ex-Navy chef and the official chef of Team Fat Paddler. Has produced outstanding meals during events including lamb sausages and Canadian pancakes with bacon and maple syrup. Tanya joined TFP in the aftermath of HCC12, claiming she only hung out with us to get a few hours relief from her kids. Since joining Tanya has been blooded (literally) on Gelo Cliffs, sealing her membership in the TFP Hall of Fame. Grant does something with buses we think, but when he’s not delivering big Volvos around the country he’s likely to be paddling fast in some filthy stretch of water like the Cooks River. If you shake his hand, we suggest antibiotics afterwards. Mike, otherwise known as Inspector Gadget, is the logistics specialist in the team. No matter what you need, for any task, at any time of day, just ask Mike. He’ll reach into a pocket and produce the perfect gadget for the task! Rob seems like a friendly laid-back guy but he’s actually a Terminator in our midst. Don’t train with him, it’ll really, really hurt. And I’d hate to think what he’d do to you if your name was Sarah Connors. He loves skis, beers, and bbq. He works in the mines of WA. And he lives in the City of Serial Killers. If a love of beer and sausages didn’t sell him in, fear of being stuffed into barrels brought out the welcome mat. Unlike most of us, Andrew is a highly accomplished paddler. If you’re lucky, he’ll casually drop into conversation the time he paddled across Bass Straight from Tasmania to Victoria. We’d hate him, but he’s good value and not shy of smashing an egg and bacon roll. When the Mogo isn’t jet-setting around the world setting up television infrastructure at international motor sports events, he’s drifting around Sydney Harbour on a kayak. When he’s not falling off that is. Mick has that motorcycle-riding enforcer look about him, unless he’s paddling, when he looks more like a motorcycle and kayak-riding enforcer. He smiles a lot at you… but then again so do lawyers and sharks! Ben is not only one of the fastest paddlers on the TFP roster, he’s also an expert at repairing damaged skis. A perfect fit, plus rumour has it he doesn’t mind being paid in egg & bacon rolls…. The tall, vet from country SA has one of the weirdest paddling styles we’ve seen – long slow strokes with a catch starting almost at the nose of his ski, which looks like he’s moving at snails pace. It’s deceptive, because he tends to break the sound barrier! Tom isn’t exactly fat. We’ve had to get custom tshirts made for him since we’ve never placed an order for a “Medium” size before. That said he makes up for his lack of girth with a bunch of attitude, most of which is directed at the other member of TFP that he is related to. Trust us when we say it’s a fun dynamic! Mike is a Fat Paddler success story. Once weighing slightly more than a full cement truck, through paddle training and more he’s now lost buckets of weight and pretty much smashes all of us in competitive surfski races. Look out for his sleek carbon surfski … it’s a menace on the water! Darren came to our attention during the Summer Series of 2011/2012 – he’s fast on the flat but thankfully falls out a lot when it gets a bit rough. He’s been known to smash anything with egg or bacon in it, which made us immediately like him. Pete is a mysterious agent doing shady things at discreet hidden compounds across the country-side. Some say he is developing a prototype military-spec ski for the government, whilst others say he is “interrogating” puppy-farm owners in the fight against animal cruelty. Josh traveled with Team Fat Paddler to Mauritius where he met female South African paddlers and decided he needed to be a part of the sport! He also happens to be a qualified diver which is pretty handy considering how badly he paddles. Trav is the canoeists canoeist. With over twenty years paddling, portaging and exploring the outdoors, Trav is the perfect Scout and handy to have onboard for any outdoors mission. He also owns Paddle & Portage Canoes, importers of awesome Wenonah canoes. The Riddler’s application for TFP was sealed with a video of the worst seal entry we’ve ever seen. Not only did he do it once, but twice, proving his credentials as enthusiastic but a little mad, a perfect combination! A paddler who plays with airplanes, Robby is a fast surfski paddler with far more enthusiasm than real skill. This makes him a perfect addition to Team Fat Paddler, although we secretly think he’s probably a tad better than he lets on. Mark is a dirty Englishman who supports sporting teams of disrepute, but he doesn’t mind a paddle or two. He and FP have gone toe to toe in a number of sports and FP is particularly looking forward to watching him in pain during paddling events to come! Nice looking crew… But you need to send Gelo out to recruit some women for the team… Using his “Blue Steel” of course!!! I agree, it’s weird that no women have stepped forward to join the team. Then again, women don’t usually like to associate with the word “fat”! Still, having some women officers would be a good way to balance the team…. any takers out there?? Any other internationals keen to join?? Yummy saucerages? Canadian pansnakes with bacon and maple syrup? Coaching by the likes of Captain Kuk and Helen Wilson? You mates sure are livin’ large down under! Perhaps that’s why you’re known as Team Fat Paddler. Will have to get out again soon. Great outfit you’ve got there, FP. Looking forward to seeing one of you become Admiral of the Fleet. Will there be a suitably decorative uniform for such a lofty position? I expect to see no less than an Armada. Take advantage of the power of G+ Hangouts for your strategy sessions. Love to be a ‘fat paddler’, already am to size and really a female melbournian should be an essential to the team 🙂 now to add the iconic Murray Marathon to the participating events. Love the intro to all your team members. What a great groupl. I’d love to be at a party with all of yez, it would come close to the best party ever, I’m sure. Fun!!! It’s really wonderful to see TFP grow and thrive. Haha, thanks Nancy. I think my 40th bday with TFP left it’s mark as one of the greatest and most difficult to remember parties ever!